Every month LeapFrog pick a new book to be their "Book of the month", last month it was the turn of Jake and The Neverland Pirates, well this month sees the girls taking over as Disney Princess Adventures Under Sea is their top pick. The princesses have got a book all of her own which is compatible with both the LeapReader and LeapFrog Tag but can also be read by itself. I'm sure it comes as no surprise that all of my girls absolutely adore anything to do with Disney princess. We actually ran a family book club party a couple of months back that saw them dressing up as Sofia and really getting into the spirit of things. Now this latest book is aimed at 5-8 year olds as part of Read On Your Own series. 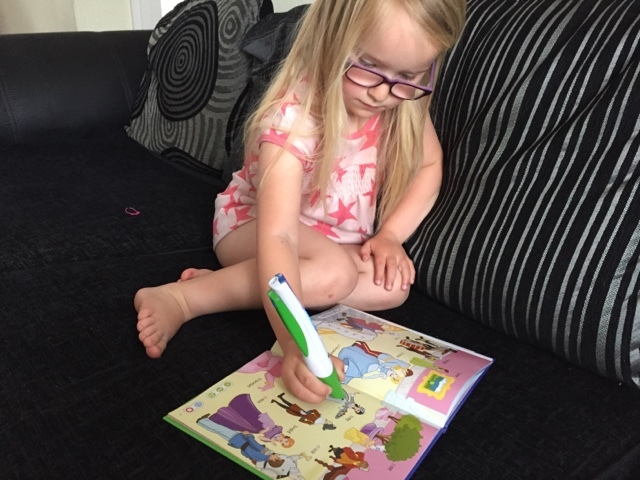 I mentioned in a previous review that I love the LeapReader as it really brings stories to life, words and pictures become interactive and they really manage to jump from the page (metaphorically speaking). This story inside the book follows Ariel as she goes on a little adventure with her friend Flounder the fish. They go on to discover some wonderful treasures hidden within a sunken boat. Things get a little scary when a great big shark starts to chase the pair..
As the story progresses we get to see elements of teamwork, as the two work together to escape the clutches of the shark and it's nice to see a happy ending. At the end of the tale we get a chance to see some other princesses, Cinderella and Jasmine are their to teach the kids a little bit about words. There is plenty of vocabulary to be learnt with short vowels, consonant blending (something my 5 year old is concentrating on right now) and showing how words turn from singles into plurals. You will even a find a puzzle where you need to match up the words with the pictures. A wonderful book to be read independently or with others. It not only contains lovely story but it has meaningful and important messages enclosed within it too. Independence and fun adventures can be a good thing to do but sometimes teamwork is needed and appreciated. I think the good thing with this LeapFrog book is that it is about a character kids know and love so they are likely to listen and take on board what is being said. As always fun and educational at the same time, a good balance that makes the book appeal to both kids and their parents.